The Dodge Challenger pace car may be the most infamous car ever to run at Indianapolis due to the tragic circumstances surrounding its day at the track. The car was driven by local car dealer Eldon Palmer. During practice laps, Palmer had used a cone to indicate where he should begin braking in order to bring the heavy car to a stop before the end of pit lane. When Palmer took to the track on race day, somebody removed the cone from pit row, and by the time Palmer realized it, it was too late to stop. The car ended up careening into the photographer's grandstand at the end of pit row, injuring twenty people. 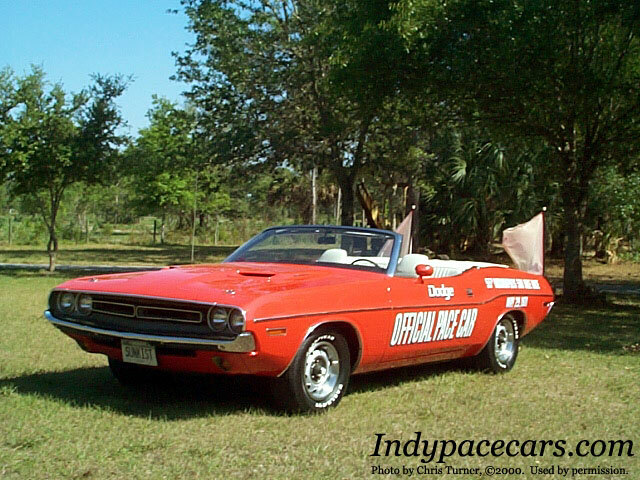 According to Indy 500 Pace Cars, 2165 Challenger convertibles were built in 1971, and 167 were equipped with the 383-cid V8 engine. The book states that "about 50 of the 2165 convertibles were pace car replicas, painted bright 'hemi orange'. . ."1 However, noone seems to know exactly how many hemi orange convertibles were actually produced. Records show that there were 50 cars actually used at the track, purchased by Eldon Palmer and several other Dodge dealerships. Because of the low number of hemi orange convertibles produced and the lack of good records, the 1971 Challenger has become the subject of numerous debates. Fortunately Gene Piurkowski of Rindge, NH has been gracious enough to share with me a list of VIN numbers for the original 50 track cars, which he says was given to him by Eldon Palmer on February 17, 1994. As a public service, I am publishing the list here. I also hope to compile an unofficial Challenger pace car registry, so if you own one of the cars on this list or have any information about any of them, please e-mail me. This is not a definitive list of every Challenger pace car replica, nor can it be confirmed that it is 100% accurate, but it is a start. Please support this website by visiting our sponsors! All content ©1999- Indypacecars.com and may not be reprinted without permission. affiliated with, sponsored by, or endorsed by Indianapolis Motor Speedway, LLC or Brickyard Trademarks, Inc.